Long coastline: There’s over 4km of golden sandy coastline on Blanes holidays, meaning there’s a good choice of beaches. 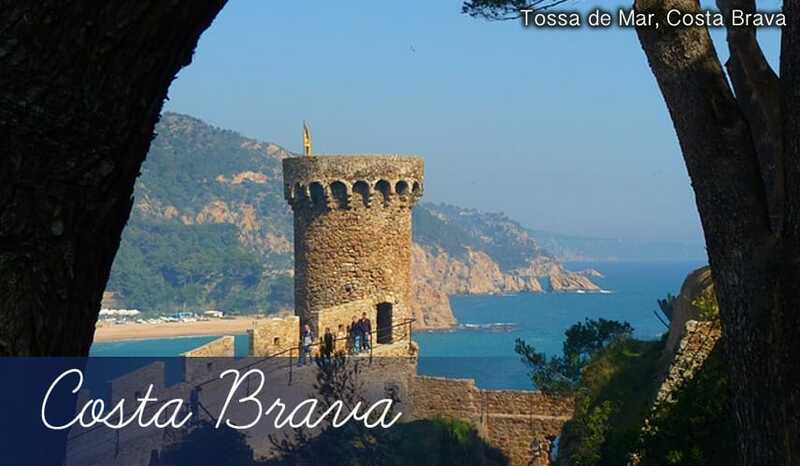 At 3.1km, S’Abanell takes up a good chunk of that and is actually the longest of all beaches in Costa Brava. Lush gardens: The two botanical gardens in Blanes are world famous for being exotic places of paradise. Mar i Mitra is has many huge cacti and is in a stunning location overlooking the sea. While Pinya Rosa is impressive for its vast diversity of plantlife. Super shopping: There are over 650 shops within Blanes so you’re certain to find something you like on holidays here! There’s also a large market held every Monday and Saturday within the town centre. Marimutra: This botanical garden has been cleverly themed by country or continent, so you’ll see lilies and orchids in the Japanese section and olive, cork and palm trees in the Mediterranean section. Best of all though is the Mexican area, which has huge cacti (over ten feet tall) in all forms of shapes and prickles! The garden is uniquely positioned on the coastline of Blanes, so you can see rocky cliffs and overgrown green shrubs at the water’s edge. Even the rustic farmhouse (serving as the entrance) fits in with the style of the place perfectly. Pinya de Rosa: A real memorable visit on holidays to Blanes, this garden was created in 1954 and is awash with every shade of green interspersed with vibrant colours. The mirror-like ponds in the park add to the beauty of the plants, and there are over 7,000 interesting varieties on show here. Like Marimutra, this park also has many different large cacti as it has a tropical theme throughout. S’Abanell: The longest of all beaches in Costa Brava, S’Abanell is over 3 kilometres of unbroken coastline and soft golden sand. With a shoreline like this, it’s no wonder beach holidays to Blanes are becoming ever more popular. The flat, clean palm-tree lined promenade is very close to the edge of the beach so it makes for a pleasant walk if you feel like stretching your legs after sunbathing. Blanes Beach: This beach is much smaller than S’Abanell, although it’s equally popular on holidays here due to its central location near to the centre of Blanes. Being one of the main beaches in Blanes, it’s also well-supported with bars and restaurants, as well as sunbeds and water activities. San Francesc: Perfect for peaceful holidays, San Francesc is one of the quietest beaches in the Blanes area, it’s well worth taking the short 2km trip out of town to get here. This sandy cove is enclosed on both sides by pine-covered mountains which lead into shallow turquoise waters. El Celler de la Puntaire: The diverse Mediterranean menu here makes this restaurant a cut above your average eatery during beach holidays. Quality ingredients go a long way in making a dish delicious and with El Celler de la Puntaire much of it is sourced locally from organic farms. The lamb in particular is so soft it almost melts in your mouth. And by adding edible flowers particular attention has been paid to making salad an interesting component of the meal, rather than a boring side dish! Cafe Terrassans: An authentic tapas restaurant offering a huge array of small dishes, giving you great variety for your meal. Fried squid, tomato meatballs, chorizo in red wine and garlic prawns are just some highlights from the menu. Sa Nansa: Seafood is the speciality of this restaurant, and it helps that much of the fish is caught locally from the coastline of Costa Brava itself. The lunch menu has very low prices for three courses of surprisingly high quality offerings like lobster, garlic prawns or roasted sea bass, meaning cheap holidays to Blanes don’t have to lack luxury. Family evenings out: Holidays to Blanes are not as lively as holidays to nearby Lloret de Mar, but there are enough bars here for a fun night out. They’re great for family friendly holidays too, with British style pubs like Borroucho Bull having plenty of toys and games to keep children entertained. There are also some Irish themed pubs such as Crawleys which have a very warm and welcoming atmosphere. Old town style: There are a surprisingly large number of fashion boutiques and designer shops in the old quarter of Blanes. Along the tightly winding, narrow streets of this district you’ll see classy shops like La Coste and Mango, as well as independent shops selling original items. Twice weekly markets: There are municipal markets in Blanes held every Monday and Saturday with over 100 stalls selling all sorts of different items. With a bit of luck, you’ll be able to barter for a real bargain on locally made craftwork, ceramics and leather goods!